Thanks a ton for your wishes guys, highly appreciated. Regarding the sizing... Did you pick the same size in xhsib & uhr? The measurements seem very similar for the same tag size, despite the latter being loomstate. If I kind of have the potential uhr size nailed down, would I be asking for trouble going down 1 size on the xhsib? The uhr I tried on was a snug-ish but not tight fit on the waist and I could soak and wash them with no fear. Sizing questions are mundane, I know. I quite enjoy talking sizing. I have W34 in the UHR and W33 in the XHS. Both fit right, but differently. The bigger pair are relaxed, the XHS more fitted. The thing to remember is that the UHR will shrink more than the XHS. @Crit_Obs grab your favorite pair of jeans and measure the waist. Whatever you get subtract 1 inch from that and that is what your size is. Pretty much what neph said but remember the waist is going to stretch an inch and the jeans should be difficult to get on the first couple wears, and very difficult to button. My waist is still snug enough that I have to slightly exhale when I button mine up. Use this to see how they measure, so you are measuring the same way. @Crit_Obs I shouldn't have said size... I mean waist measurement. This is almost always different than the tagged size. Wow, colours are looking amazing. Hoping to get my hands on a pair soon! 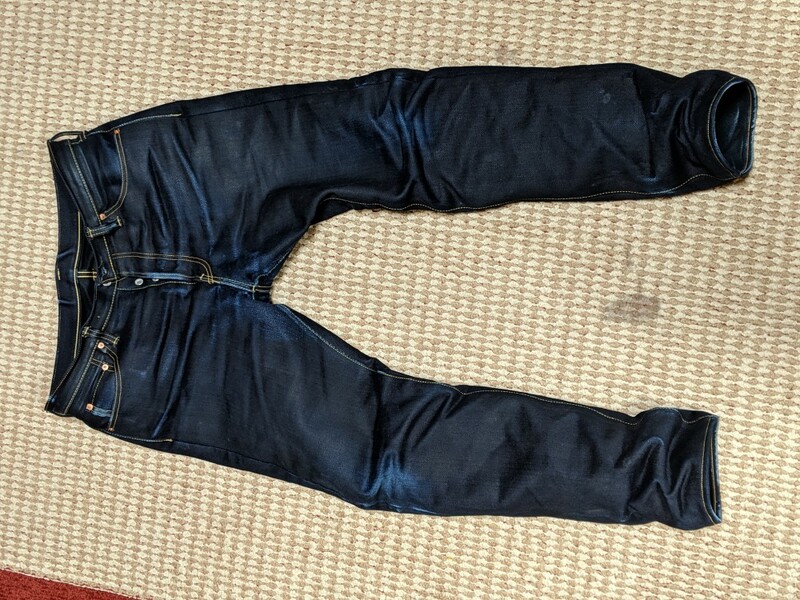 But alas it was you who compelled me to purchase the 25oz 888-XHSib Indigo/Black 38's....just got the 21oz straight cuts, sublime, great jeans, appreciate all your knowledge on the subject. This pair looks epic, I'm a 38 around the waist, the pair I ordered came in at 38.5, they had a pair of 36's that measured 37.2, but I know with the wash, they'll shrink, and want them to be comfortable. Talked with Adam about sizing, hope I made the right call with the 38's...if they shrank to a 37, that would be perfect. Glad to be a member, glad to have two pairs of fantastic jeans, going to take the 21oz in tomorrow to get them hemmed. Ohh...and would you cuff the 888XHSib's? I was not impressed with the 25 oz Samurai Jeans at all. Mine are balled up in the garage been sitting there for months. In fact you can have my pair for free. You pay shipping. I probably can get them to you for under $15 if we go cheap. You might have to wait a while though because I am only home for today then I have to go back out of town for work again. They are size 38. They may or may not have a bit of concrete on them. But I think that should brush/ wash off after a while. When I get a chance I will wash them and clean them up. Iron Heart is way, way better in my humble opinion. Hi Filthy - what a great offer, I'll PM you and definitely will take care of shipping and I insist on at sending you some funds towards the jeans, I'll send you a PM later today. The Iron Heart, Lord Thunderin' Jaysus, glad I read your thoughts on how to button....that was some fun. So I've washed them once, turned inside out, have now left the first three buttons done up. These jeans, along with the 6's 21oz straight cut, are the nicest jeans I've ever worn. Next step for me after wearing and working them in for awhile will be working on getting the sizing perfect, the colour of these jeans is sublime, and they feel great. So I've read your washing routine to get them down to size right. 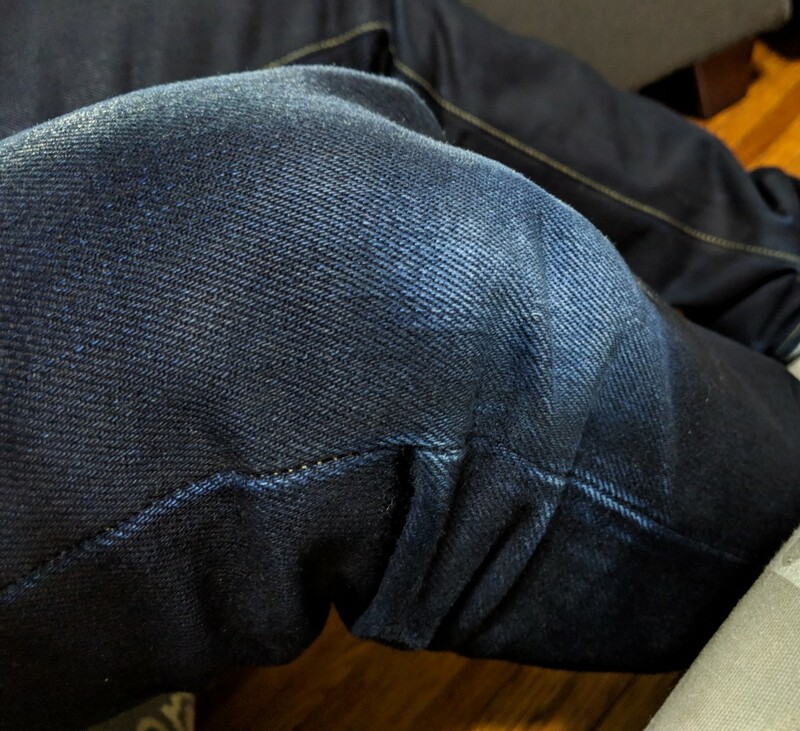 I get what you were saying about shrinkage on the thighs, so I purposely used a delicate 20 minute machine wash on hot with no spin, drip dry, and had to inhale a tad to get them done up. Still loose on the sides, and could all round be a more snug fit, but baby steps on these. The denim from this company is super nice, as someone who also has a hobby of collecting and restoring antique straight razors (Wade & Butcher, GB, etc.,) this denim would make a superb razor strop....a lot of people don't realize, that aside from stropping the razor on leather, many would simply use their the thigh area on their jeans to strop up a razor, or fashion a strop out of an old pair of jeans, puts a nice edge on the razor. Heading out for some errands with the 25oz on, still feel like walking around in cardboard pants, but their quickly softening up. Sheesh, if I had of grabbed the 36 that measured in at 37.2, think I would of been in a world of hurt. Sweet. Have a good one! I was not impressed with the 25 oz Samurai Jeans at all. @Jordonf9 your jeans are looking good. Keep on wearing. So I actually gave them their first soak/wash not long ago. Letting them air dry till tomorrow or however long it takes. Did see a lot of indigo wash out, can't wait to see them dried. I also threw on my OD 18 vintage denim...they feel SOOO lightweight now. I wore the 25oz every day since I got them Feb 4th I believe. So About 70 days. 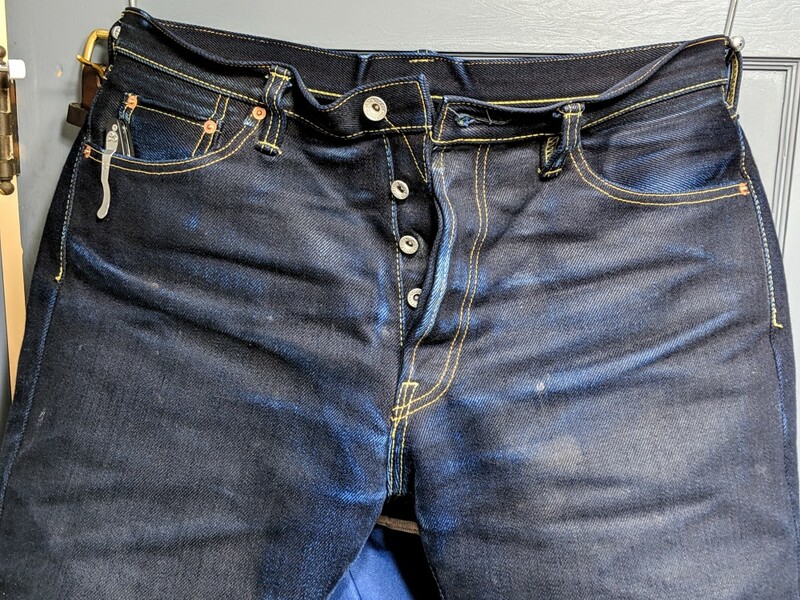 I did not care for the denim, it didn't seem as heavy as an Iron Heart 25 oz (was more like an Iron Heart 18 oz). Also the softness and smooth hand of the Iron Heart XHS has me spoiled. It's not fact or anything... just my biased opinion. Also I bought it for a fast fading pair of jeans. But I was just meh on the colors.